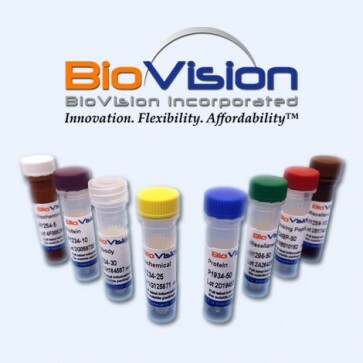 Annexin V-Cy5 Reagent | 1013 | BioVision, Inc.
Annexin V-Cy5 is a bright fluorescent reagent for detecting of the early stages of apoptosis. During apoptosis, phosphatidylserine (PS) is translocated from the cytoplasmic face of the plasma membrane to the cell surface. Annexin V has a strong, Ca²ᶧ-dependent affinity for PS and therefore serves as a probe for detecting apoptosis. Cy5 fluorescent dye produces an intense signal in the far-red region of the spectrum and therefore it is very useful for multiple labeling of cells with green and red colored fluorescent probes. Cy5 yields fluorescence with a λmax emission of 670 nm. Scheffel, Matthew J. et al. (2016) Efficacy of Adoptive T-cell Therapy Is Improved by Treatment with the Antioxidant N-Acetyl Cysteine, Which Limits Activation-Induced T-cell Death, Cancer Res. 2016 Oct 15;76(20):6006-6016. Liu et al., Adapting a Drug Screening Platform to Discover Associations of Molecular Targeted Radiosensitizers with Genomic Biomarkers. Mol. Cancer Res., Apr 2015; 13: 713 - 720. Alagesan et al., Combined MEK and PI3K Inhibition in a Mouse Model of Pancreatic Cancer. Clin. Cancer Res., Jan 2015; 21: 396 - 404. Keerthivasan et al., Aberrant overexpression of CD14 on granulocytes sensitizes the innate immune response in mDia1 heterozygous del(5q) MDS.Blood, Jul 2014; 124: 780 - 790. Suzuki et al., Functional Swapping between Transmembrane Proteins TMEM16A and TMEM16F.J. Biol. Chem., Mar 2014; 289: 7438 - 7447.